For those seeking peace and serenity for their time in the Keys, "Spoonbills' Escape" is your quiet oasis. This rental is fully outfitted as a comfortable home-away-from-home. "Spoonbills' Escape" is located just a stone's throw from the resort-style community pool at the Key West Golf Club. Located within an exclusive gated community at the entrance to Key West. This private home features numerous tropical touches that will be constant reminders that you are staying in America's Paradise. 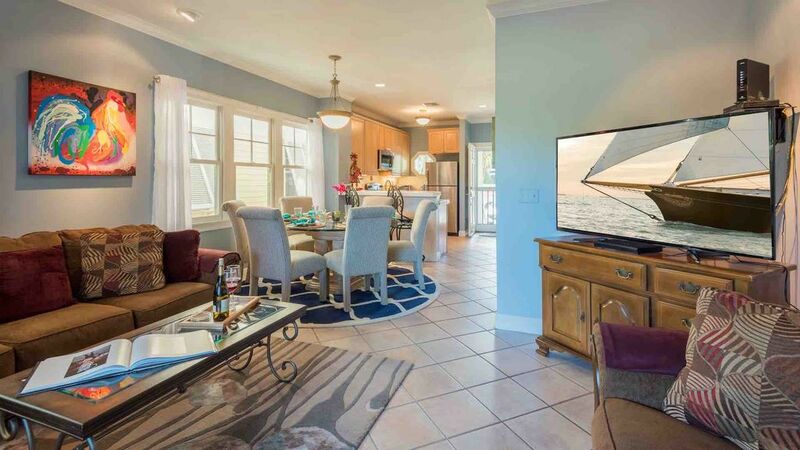 The open and airy living area facing the Fairway has plenty of room for entertaining with a large flat screen TV. You'll never feel closed in at "Spoonbills' Escape", with porches upstairs and downstairs at the front and back of the house. The kitchen is fully equipped with top-of-the-line stainless steel appliances and all of the tools you'll need for preparing a meal at home. An indoor dining set with space for 6 at the table is the perfect option for a meal in, with an additional 2 seats at the kitchen bar for a quick casual bite. >> Master Bedroom: Located on the Second Floor with a King bed, a flat screen TV, vaulted ceilings, direct access to the private porch with views of the golf course, and an en-suite bathroom with twin vanities and a large walk-in shower. >> Second Bedroom: Located on the Second Floor with a Queen bed, a flat screen TV, direct access to the front balcony, and an en-suite bathroom with a shower and tub combination. >> Den/Additional Bedroom: Located on the First Floor with a Full bed, a flat screen TV, and access to the third full bathroom on the first floor with a walk-in shower. The gated community at the Key West Golf Club is about much more than golf. It is a haven for residents and vacation guests alike who want the peace and quiet of a gated community combined with a convenient location very close to everything Key West has to offer. There is 24-hour security, two resort-style community swimming pools and plenty of parking. Just a short bike or Uber ride from Old Town and the beaches, the Key West Golf Club offers the best of both worlds: you will be very close to all of Key West's many attractions but you can go home to the privacy and solitude of Key West's nicest gated community. This was a professionally managed property which makes all the difference. The property manager, Steve, met me and walked me through the unit, gave me two books full of information about the unit and Key west, and most importantly, when we did have a small problem, he RUSHED over to provide a temporary fix while the permanent fix was in process. The unit was very clean. The Kitchen was fully equipped. the Grille was great, and the view out the back to the golf course was beautiful. For those of you who know Key West, I NEVER heard chickens crowing (which made sleeping much better than old town). I would rent it again! This was no vacation for my husband and I as we were displaced by Irma. We stayed for two months while Demolition at our home in Ramrod was under way. We felt at home at Spoonbills Escape. I highly recommend this rental. Also the property management folks are wonderful...very accommodating. We were looking for a place in Key West when my son invited us to share his rental. We loved this place with its tropical feel and location so much we were excited to be able to book it for the following month. It’s quiet while still an active community and close to everything. We were only 5-10 minutes from any place on the island, so every place was close to our home away from home. This rental was perfect for the two of us and conveniently accommodated additional guest in the additional two bedrooms. We loved having our morning coffee on the screened porch while watching the wild life on the golf course (Yes the ducks came right up to our back gate). The kitchen had stainless steel appliances (wish I had these at home) and was fully equipped with everything we needed to prepare great meals. The bathrooms (one for each bedroom) were stocked with plenty of towels, the beds were extremely comfortable and there were TV’s in every room. When I wanted some alone time I could escape to the porch and read one of the many books provided by the owners while enjoying the view. For an evening at home we were provided with various games and puzzles to choose from. We loved this place. I have been to Key West several times, but this was my first extended stay. There is always something to do in Key West and Duval (street) is only a short drive or bike from the condo and a great place to grab a bite to eat or catch the latest band. The rental was on the golf course so I had an awesome view while grilling and enjoying meals on the screened in porch. TV’s in every room made it easy to keep up on the latest game or news. One of the master suites had a King size bed, a walk-in full size shower and its own private porch----perfect! The other master suite had a queen bed, a tub/shower combo, and its own private porch, which was perfect for guest. The bedroom and full bath downstairs was great for my parents who have difficulty climbing stairs. The two things I want in a kitchen, a pizza pan and an ice tea maker; this place had both and a lot more. This community offered plenty of options from walking, spending time at one of the two pools, golfing, biking and if you really wanted to get into shape, they had a fitness facility. My favorite pastime was spending time at the pool just a short walk from my condo. This place had something for everyone and a space for everyone. Great stay! This was the perfect place for a getaway. Just a short distance from all the action downtown. I could even bike there! There were two pools and a fitness center on property and I could walk right out to the golf course. This place had everything I needed and things I didn't even know I needed. This place had just come on the market when we stayed and everything appeared to be mostly new. Great place can't wait to return next year.